I have been wanting to make Baked Brie for years. Brie happens to be one of my favorite cheeses and I was immediately intrigued by the fact that it can either be baked in a sourdough bowl or in puff pastry. Last November we had a Fancy Wine & Cheese party and I decided that it was time to go all out and make Brie en Croûte! I did a little research and none of the options tickled my fancy. I thought about it for a couple of days and imagined the possibilities in my head. 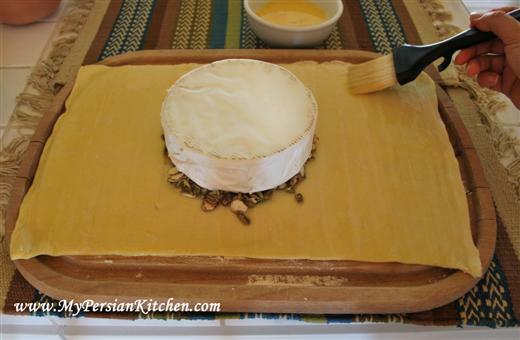 Then it hit me all of a sudden, what if I Persianized Brie en Croûte?!! The afternoon of our party I entered my kitchen and went right to work. I have to say that I was mighty surprised by the result myself because at times my imagination runs wild when putting flavors together, and I would be lying if I said the end results are always good. But this one? This one blew me and those who had it away. I have made this recipe three times and everyone has fallen in love with it. It is so different and it smells heavenly. I promise you, this is a crowd pleaser, a perfect treat for any party! I have to confess that my most favorite reaction to this recipe came from my friend Kumar. We were at his house over the weekend when I made it the last time and cook pictures of the process. Even though he was at our party the first time I made it, I loved his delighted reaction to the smell and taste of it when he had it again over the weekend! You see these fabulous ingredients? They come together so beautifully! They are going to blow off the roof! 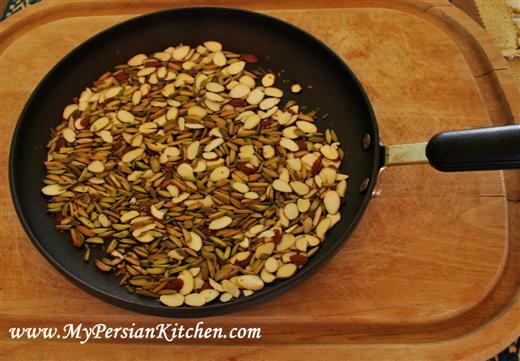 Prepare your egg wash. For a tutorial on this please see post about egg wash.
Toast the almonds and pistachios being careful that they don’t burn. Gather all of your ingredients. 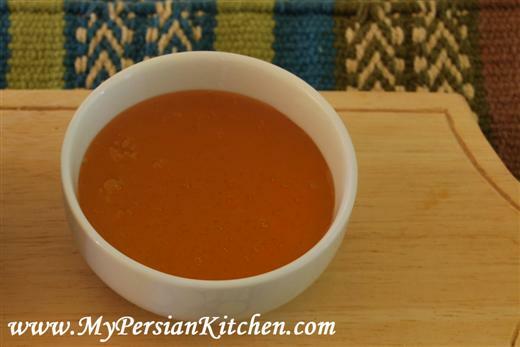 Place honey in a microwave safe dish and heat for 30 seconds. 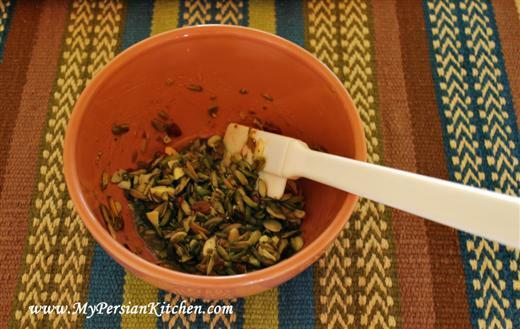 Then add cardamom and mix well. 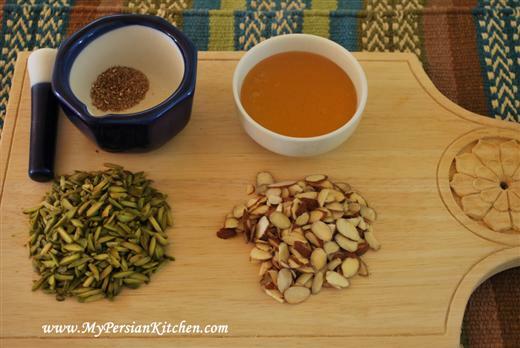 Immediately add the nuts and mix well so that the nuts are coated with honey. It is much easier to mix everything when the honey is slightly warm. 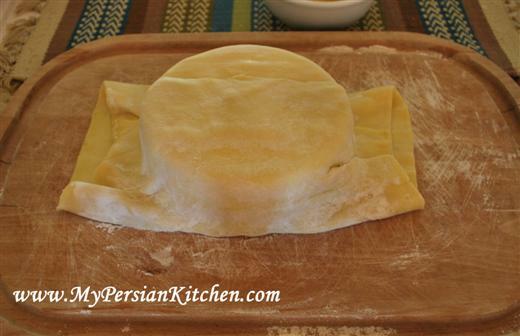 Lightly flour a board and carefully open the puff pastry. 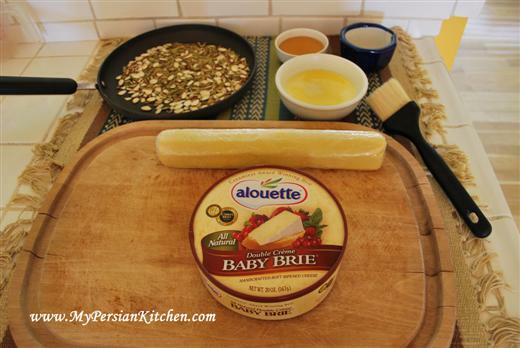 Spread nuts in the middle in a circle about the same size as the brie. 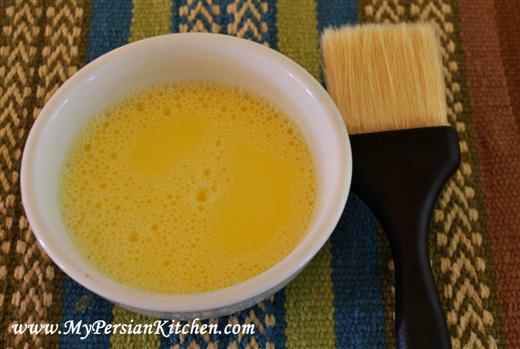 Brush the perimeter with egg wash. Fold over and delicately press down to seal. 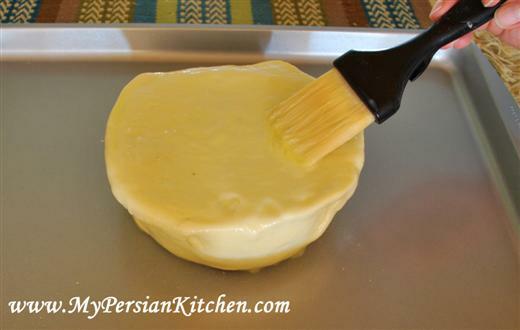 Gently press the puff pastry against the brie releasing air. Fold over the sides and seal shut as best as you can. Cut off excess from the side. Don’t discard, save them, we will get to them in a flash! Continue folding and sealing until all the corners are rounded. 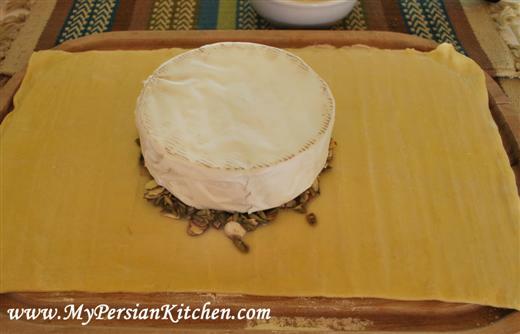 Place brie seam side down on a baking sheet. Brush with egg wash all over. Cut out shapes from the left over scraps and place on top. 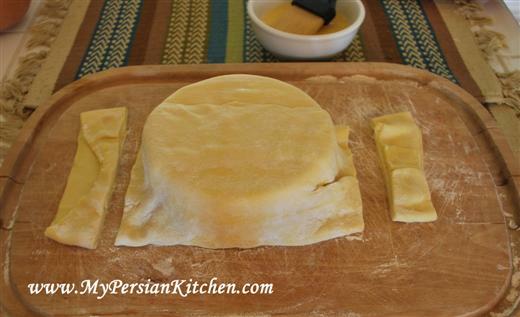 Brush the top of the shapes with egg wash. Bake at 400° for 25 minutes or until the puff pastry is nice and golden. Let rest for at least one hour before serving allowing the Brie en Croûte to reach room temperature. Look at the delicious brie oozing out of the puff pastry here! I got to it a little too soon as we were all impatient to dig in! Have no fears though, it is good this way too. There is something magical that happens to the brie between the nuts, the sweetness of the honey, and the heavenly flavor of cardamom. The smell alone will flirt with your nose to no end! Simply. So. Good! Serve with crackers or sliced baguette. And please don’t forget the wine! looks wonderful and easy too. can’t wait to give it a try. @ Azita, it is indeed pretty quick to make and very yummy. Let me know how you like it when you make it! @ Bria, thank you! Indeed decadent! It’s so different and the smell of the cardamom, I can’t even begin to tell you! This is something I may try this weekend! I hope you do try it Aaron! I made this last night for my Persian boyfriend. He went crazy! This is absolutely delicious, and really not much trouble to make at all! 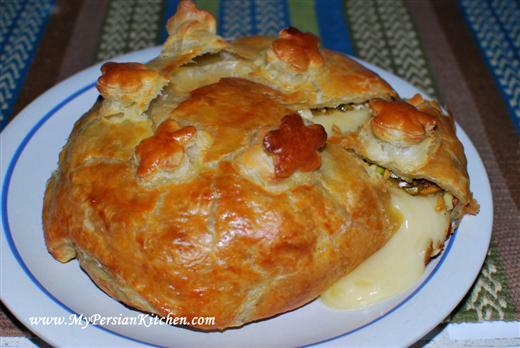 I’ve always loved baked brie, but your Persianization of this classic app just sent it over the top. Thank you for this wonderful recipe! I can’t wait to make this again and share it with my friends. P.S. I LOVE your blog, and I’m looking forward to trying so many more of your wonderful recipes! Melissa, it’s good isn’t? It’s like a serious party of different flavors in your month!! So glad that you and your boyfriend liked it! Please do let me know how you like the rest of the recipes! 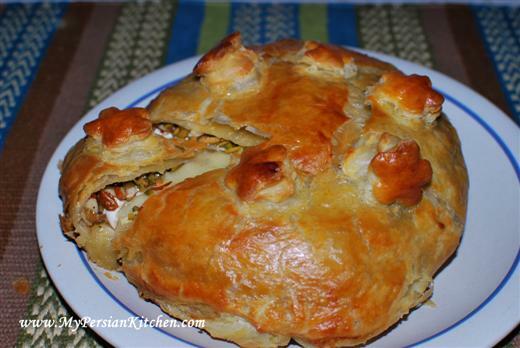 This can be sooo much more Persian-Fabulous! 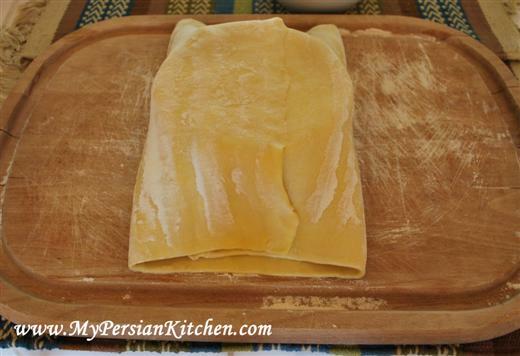 Just take the time to prepare some zereshk in a little butter in a pan and fold it into your mixture of pistashios… I love this sour and crunchy mixture with the brie! MsParinaz, you are totally feeding into the insanity, and I LOVE it!!! Just a question. Can we make this recipe in the microwave? It is delicious, but sometimes my oven is busy. cemman, no I wouldn’t make it in the microwave. Hi! This recipe looks so delicious and want to try it very soon! 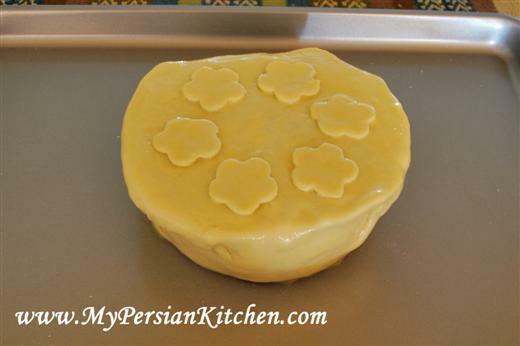 Just a question, for the puff pastry… can I purchase it at any grocery store? Which brand would you recommend? 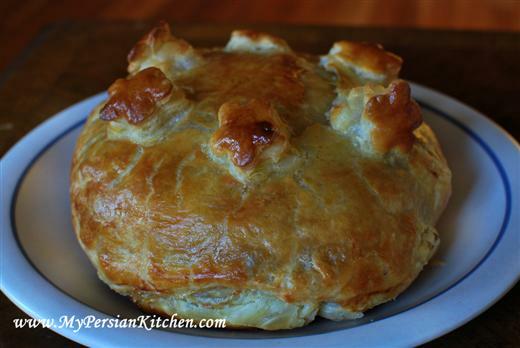 Sorry if this seems like a silly question, I havent baked anything with puff pastry before. 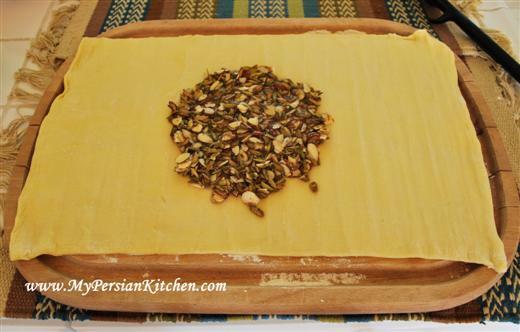 Noor, puff pastry is available in the frozen section of most grocery stores. I don’t really have a favorite brand. Good luck! I cannot eat gluten, but I’m going to make this for my brother’s and SIL baby shower. Our family and friends are real foodies and this Brie sounds so delicious, I believe everyone will enjoy it.